For any hardware add-ons — which tech folk call peripherals — Windows 10 has a trick up its sleeve. Thanks to plug and play technology, which automatically identifies add-on devices, connecting new devices to your computer can be quite easy. A printer lets you, well, print documents and photos. Your choices for printers include black and white versus color, and inkjet versus laser printer. A multifunction printer also works as a copier, scanner, and fax machine. A digital camera captures photos that you can copy to your computer to enjoy and to share with others. See Chapter 10 for information on working with photos. A scanner enables you to make digital images of old photos or documents so that you can view them onscreen. An external hard drive stores backup copies of your files. An additional or replacement pointing device (your mouse is a pointing device), including a trackball or a pen with a tablet, may be more comfortable to use than what came with your computer. Switching between pointing devices helps you avoid repetitive stress. A wireless mouse eliminates the hassle of dealing with a cord. Some people like to add a mouse as an alternative to their laptop’s built-in touchpad. A microphone is crucial for communicating by voice with your computer, through speech recognition, or with your friends over the Internet. A combination headset with microphone may produce the clearest sound. A video camera (or webcam) is essential for video phone calls à la the Jetsons. The majority of these devices connect using USB (Universal Serial Bus) technology. 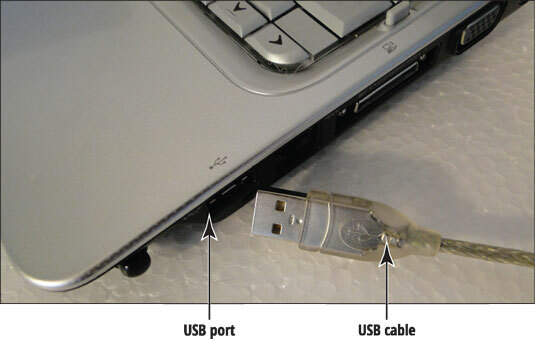 When you connect a device to your computer using a USB cable to the USB port (shown), the device identifies itself to the computer. This identification process is called plug and play. Ideally, you connect your device, and it simply works. Windows 10 uses a device driver to communicate with an add-on device. The driver is really a program that tells Windows 10 how to run the device. When you connect a device, such as a printer, Windows 10 looks for a driver (in this case, a printer driver). That driver may be built into Windows 10, come on a disc that’s packaged with the device, or need to be downloaded from the Internet, either automatically by Windows 10 or manually by you. Every computer has at least a couple of USB ports. Some are in the front, and others are in the back of the computer and harder to reach. If your computer doesn’t have enough ports, you can add more by buying a USB hub, which is a small box with two to four USB ports. If a port is hard to reach with a device’s cable, you can buy a USB extension cable. Office supply stores may have hubs and cables. Bluetooth is a wireless technology for adding devices to your computer. If your computer has Bluetooth, you can use Bluetooth as well as USB to add some devices, especially a microphone or headset.